Cultists, crop dusters, and bears. 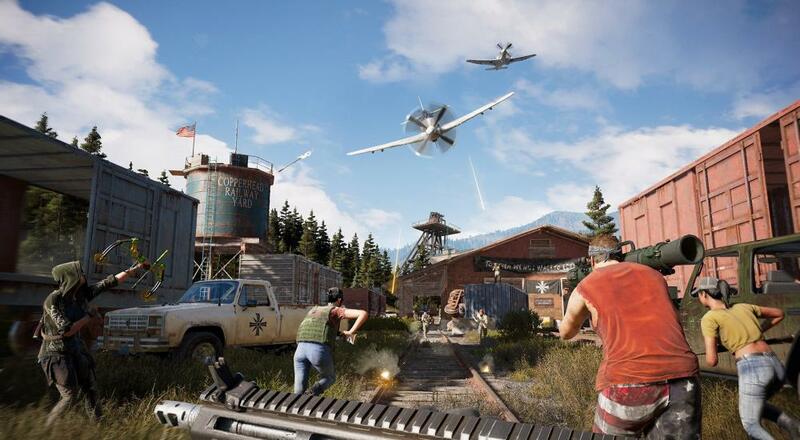 The socially divisive Far Cry 5 is set to launch in just under a week, and Ubisoft wants everybody to have the Eden's Gate Cult fresh on the brain. With reports of the game's main story taking around 25 hours to finish, you and your co-op buddy should get to know the inhabits Hope County. Last week we had a look at a goofy live action TV spot / ad. Looks like the Hope County Board of Tourism finally got that extra funding to shoot a promo video, but they forgot to edit out the massive amounts of carnage and animal attacks. Or maybe that's just part of the Big Sky State's charm. This combines my two loves: live action representations of video game characters, and bear-on-bartender violence. What would a Cult be without a retinue of manipulative leaders to run it? While Far Cry 3 introduced us to the shattered mind of Vos, and Far Cry 4 featured the sardonic Pagan Min, Far Cry 5 features a slew of even more colorful characters to flush out Eden's Gate. Does anyone else think they really nailed the "scumbag cult leader" look with Joseph here? Everything from his tinted aviator shades to his snake-oil salesman jacket make me wanna call the cops on this guy for running a ponzi scheme. The two-player insanity-fest finally launches on March 27th on the Xbox, PS4, and PC. Page created in 0.3257 seconds.